Features: Guest Room Service Cart is constructed from commercial grade plastic with easy to clean surfaces. Complete with two vinyl bags, bumpers, upper deck shelf and two front lockers. 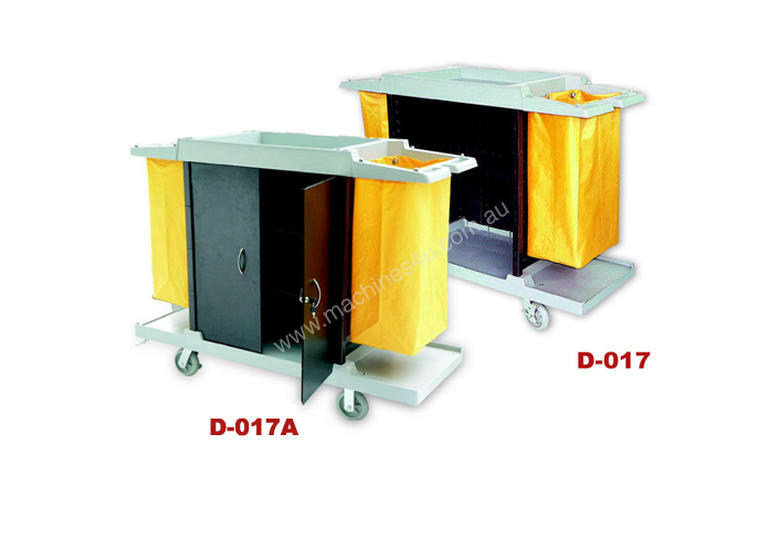 This rugged, lightweight gray high-density plastic housekeeping cart features 2 lockers carry ample supplies. The top of the cart includes a deep tray compartment to hold supplies securely in transit. 2 push handles, 2 vinyl collection bags allow the housekeeping cart to be used in either direction and one side includes provisions for towing a vacuum cleaner. Cart rolls easily on non-marring 6" rubber casters (2 swivels, 2 fixed/braking).